Astratech has released a customized version of Simplant for use with their implant system. 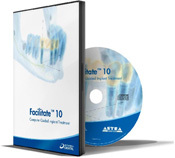 The software program also contains 3D images of implants, abutments and teeth. This ensures efficient, accurate and reliable planning of implant positions, sizes and number of implants, and abutments to be used. In addition it provides better control over the esthetic outcome. When the case is planned, a surgical guide is ordered to make sure that the planning result will be replicated in the real surgical situation.